Initially, I was pretty sure that I had a baby who hated massage. Boyfriend was really keen to practice baby massage with Quinn - especially as she's breastfed so his bonding opportunities are kind of limited to cuddles when she isn't hungry - and changing the occasional nappy! To our dismay though, despite the hundreds of benefits to baby - Quinn would just scream through any attempt at massage, regardless of whether it was me of her Daddy taking part. Quinn sees a chiropractor regularly, is in brilliant health, and it wasn't an "in pain" cry so much as a "get off of me, that's gross" cry - so I'd pretty much given up, and looked woefully at the coconut oil that sat beside my bed. However - we've now found that if we massage Quinn during the day - basically when it's really inconvenient for us - she loves it! Bedtime/after bath massage isn't her thing, in fact there's a really narrow window of opportunity in between her letting her last feed go down, but before she's getting hungry for the next one, when she isn't tired, and in relatively high spirits - late morning is a good bet. This sort of goes against my vision of a bath/massage/feed/bed routine in the evenings but at least she, and I, are benefitting from the baby massage time. It doesn't really help with the bonding with Daddy thing either, as he works six days a week ordinarily, but ho-hum. We're now starting a baby massage course at our local SureStart Children's Centre - which I'll report back on in a few weeks, just so that I can hone my skills a bit. 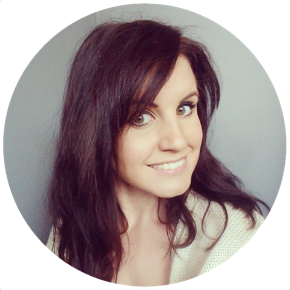 My favourite baby massage products at the moment are from Natalia, by Vital Touch, who I've mentioned a couple of times on the blog before (I used their products during my super incredible labour and birth). Vital Touch were kind enough to send Quinn and I their "Blissful Baby Box", which, like the "Labour and Birth Box", contains specially selected gorgeous, organic products, as well as an organic cotton wash cloth. I was particularly excited about the flannel to be honest because I love the one from my Labour and Birth Box, and haven't been able to find a wash cloth that soft anywhere else, so now I have two! Also in the Blissful Baby Box, new families receive a bottle of organic sunflower massage oil - which is recommended by all baby massage practitioners. It doesn't smell as lovely as coconut oil (it basically doesn't smell at all) but it is absorbed into the skin without leaving too much grease - as long as you don't use too much, and it warms really nicely in your hands. The course that I'm attending at the Children's Centre provide sunflower oil for massage, but it isn't organic - so I'm being that parent and taking my own. The box also contains a useful book on baby massage tips and techniques, which is great if you're just going to practice baby massage at home and want to know baby's getting the most from it. The real stars in this gift box though, and the products I'd definitely buy again and again, are the balms. You receive two balms in little glass jars and initially they seem like tiny trial-sized products, but believe me when I say - a little goes a long way. I use the Baby Special Skin Balm on everything at the moment. Quinn is a very chubby baby, and as such she has all sorts of rolls and folds - which means she's somewhat prone to getting red sore bits if she sweats or if I don't completely dry her properly after a bath. The Special Skin Balm soothes any red, inflamed looking skin in a single application - it's miracle stuff - I'm obsessed. Boyfriend made an attempt to saw off his leg at work the other week (he's fine, he went through his trousers but only sliced into his thigh and didn't do any proper damage) and he's been pinching Quinn's balm to put on his healing wound. The Bottom Butter is very similar but has a different fragrance and is by far the most luxurious nappy cream I've used so far. All you need is to swirl your finger against the solid balm in the jar and swipe over baby's nappy area with each change, but the balm melts in to the skin beautifully and it still smell's lovely down there at the next change! We've tried out a few organic, natural nappy cream options (because there's nothing I detest quite like Sudocrem) and this, I have to say, is my favourite so far. It's also safe to use with cloth nappies (some nappy creams will effect the absorbency of your cloth nappies). 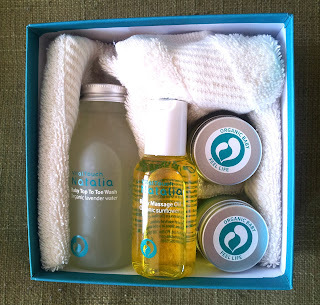 Last but not least, the Blissful Baby Box contains a 100ml glass bottle of Baby Top to Toe Wash. I don't tend to use huge amounts of these kind of products on Quinn, I've always thought it far more beneficial to her skin to wash her with warm water and then apply topical oils afterwards (not that she lets me) than to use soaps in the bath, however, as this Top to Toe Wash is oil based and all-natural, I've made an exception, and whilst I haven't noticed any difference to her skin - it certainly smells lovely and it makes her hair really fluffy - which is always nice! The Blissful Baby Box retails for £32, which seems a lot at first but when you consider the typical shelf price of organic skincare products with top end ingredients - and consider the fact that you're buying four full-sized products (plus a wash cloth and book) - it's impressive value. The balms alone will last forever as you really do only need the tiniest amount to apply to baby, same goes for the massage oil - I can be a little gung-ho with the Top to Toe Wash because it just pours out of a relatively wide necked glass bottle so it's difficult to just use a tiny amount - it kind of glugs! Still, a hugely positive review from Quinn and I - if for that gorgeous cotton flannel alone! If you're looking for a luxurious new baby gift for someone who places any importance on organic natural products - you're on to a winner with this one. Check out Natalia Vital Touch's other gift boxes, with products carefully selected for pregnancy, birth, new Mums, and newborn babies. What to expect from the "8 Week Leap"